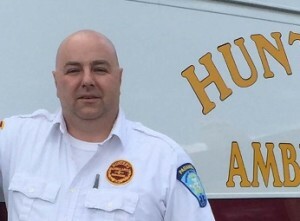 Daniel Jackson has been employed with Hunter’s Ambulance Service since November 2002. Dan joined Hunter’s as an EMT-IV, then later successfully progressed to obtain his Paramedic license in June of 2003. In addition, Dan is a Paramedic Field Instructor (PFI) and has been critical in precepting and assisting our new Paramedic employees to obtain medical control. Dan’s recommendations while acting as a PFI are valued and trusted by all. He takes the time to critically evaluate each and every call to ensure the best in patient care. Dan is being honored as a Star of Life for his proficiency and dedication. Hunter’s Ambulance is privileged to have such a committed member on our team.